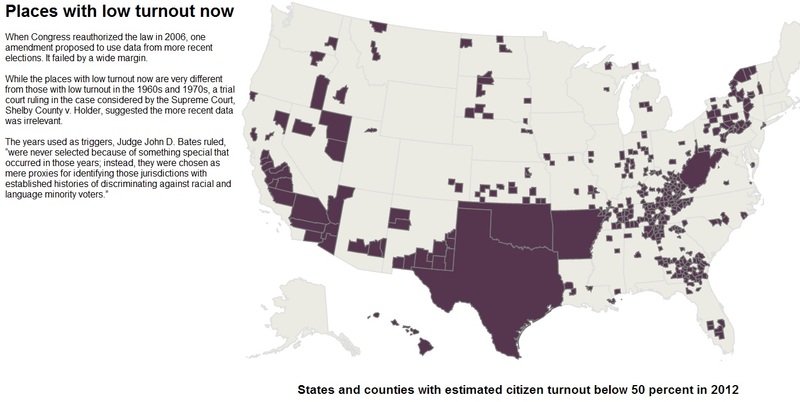 WASHINGTON — The Supreme Court on Tuesday effectively struck down the heart of the Voting Rights Act of 1965 by a 5-to-4 vote, ruling that Congress had not provided adequate justification for subjecting nine states, mostly in the South, to federal oversight. Chief Justice Roberts said that Congress remained free to try to impose federal oversight on states where voting rights were at risk, but must do so based on contemporary data. When the law was last renewed, in 2006, Congress relied on data from decades before. The chances that the current Congress could reach agreement on where federal oversight is required are small, most analysts say. Justices Antonin Scalia, Anthony M. Kennedy, Clarence Thomas and Samuel A. Alito Jr. joined the majority opinion. Justice Ruth Bader Ginsburg dissented, joined by Justices Stephen G. Breyer, Sonia Sotomayor and Elena Kagan. The majority held that the coverage formula in Section 4 of the Voting Rights Act, originally passed in 1965 and most recently updated by Congress in 1975, was unconstitutional. The section determines which states must receive preclearance from the federal authorities. The court did not strike down Section 5, which sets out the pre-clearance requirement itself. But without Section 4, which determines which states are covered, Section 5 is without significance — unless Congress chooses to pass a new bill for determining which states would be covered. The Voting Rights Act of 1965 was one of the towering legislative achievements of the civil rights movement. Its central provision, Section 5, requires many state and local governments, mostly in the South, to obtain permission from the Justice Department or a federal court in Washington before making changes in laws that affect voting. That means jurisdictions covered by Section 5 must get federal approval before they make minor changes to voting procedures, like relocating a polling place, or major ones, like redrawing electoral districts. The Supreme Court had repeatedly upheld the law, saying that Section 5’s “preclearance requirement” was an effective tool to combat the legacy of lawless conduct by Southern officials bent on denying voting rights to blacks. Civil rights leaders, on the other hand, say the law played an important role in the 2012 election, with courts relying on it to block voter identification requirements and cutbacks on early voting. Section 5 was originally set to expire in five years. Congress repeatedly extended it: for five years in 1970, seven years in 1975, and 25 years in 1982. Congress renewed the act in 2006 after holding extensive hearings on the persistence of racial discrimination at the polls, again extending the preclearance requirement for 25 years. The Supreme Court ruled that a formula used to define which areas fell under Section 5 of the Voting Rights Act was unconstitutional. Section 5 required some places, mostly in the South, to obtain federal permission before changing voting laws. The Fifteenth Amendment to the United States Constitution prohibits the federal and state governments from denying a citizen the right to vote based on that citizen’s “race, color, or previous condition of servitude”. It was ratified on February 3, 1870, as the 3rd and final of the Reconstruction Amendments.